748 c / 45.6 cub. in. Wheelbase 1400 mm / 55.1 in. Length 2055 mm / 80.9 in. Width 730 mm / 28.7 in. Height 1100 mm / 43.3 in. The luscious and expensive limited edition GSX-R750R was released to Japanese market with a return to the long-stroke motor of the F/G/H models. 500 limited edition (some claim 1000) GSX-R750R ( the 'Double R') serving as ready-to-race platform The newly redesigned engine reverted to the original long stroke (70 x 48.7mm) configuration. Crankcase, crankshaft connecting rods and clutch were among the critical areas receiving more attention necessary for the race duty. The 'Double R' also received new 40mm Slingshot carburetor and 4-into-1 exhaust pipe as well as close ratio gearbox, rear swing arm with sub frame, new aerodynamic fiber with large air intake duct, solo seating with race number box and 19 liter aluminium fuel tank as standard equipment. The dry weight measured, 187kg. 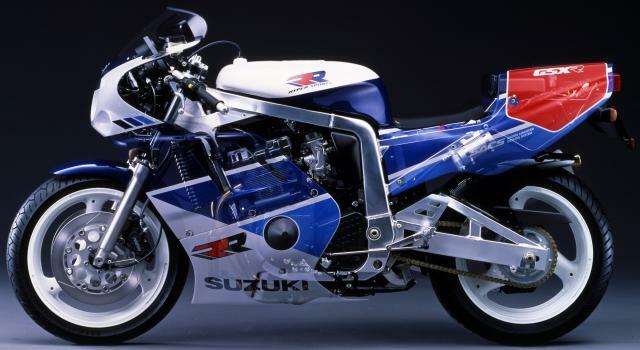 When the Suzuki GSX-R750 was launched in 1985, it was the lightest, quickest, most advanced sportsbike available to the public. ‘This pure supersports model was our first 750cc bike featuring an aluminum frame of unprecedented light weight and superb torsional rigidity. 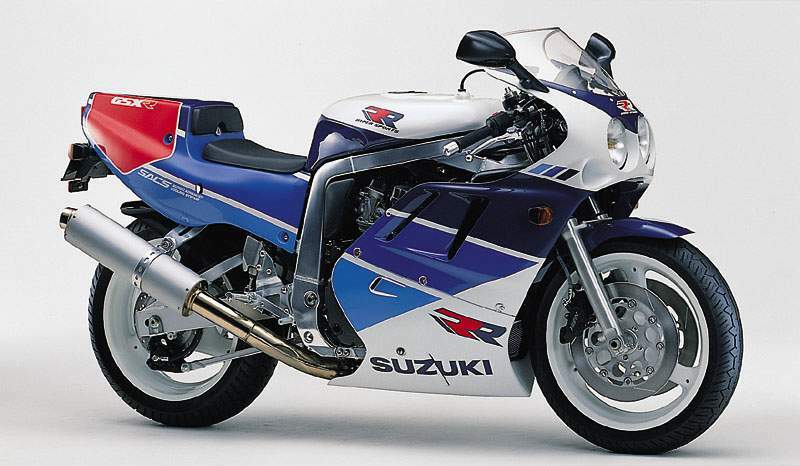 We had no real competitors in the market, other than factory racing machines,’ says Hiroshi Fujiwara, the Japanese engineer who headed the development of the first GSX-R back in the 1980s. 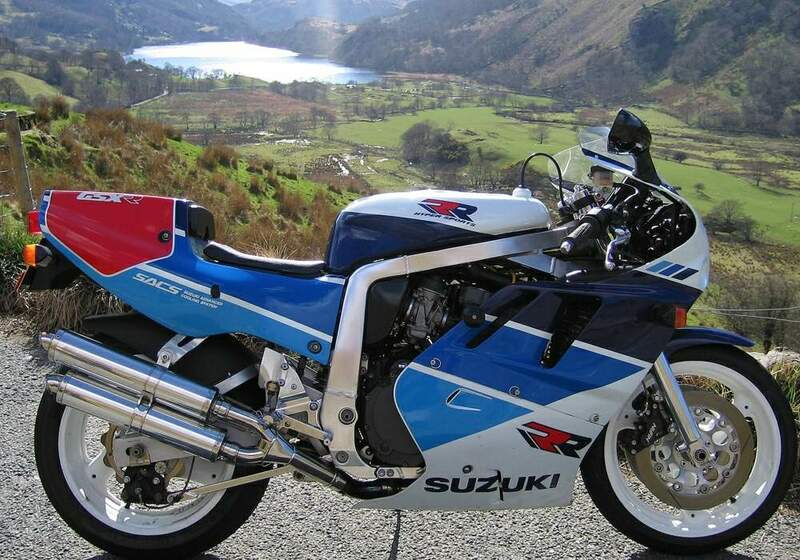 With 99 horsepower from its carbureted, oil-cooled, inline-four and with a dry weight of about 179 kilos, the mid-1980s GSX-R750 offered performance that was unrivalled in its time. ‘We knew that reaching our goal of the world's best power-to-weight ratio – required to realize overpowering performance – would be an enormous challenge,’ says Isamu Okamoto, the man responsible for designing the first GSX-R750’s engine. And yet, Suzuki not only took on that challenge with the 1985 GSX-R750 but also upped the ante in 1986 with the GSX-R750 Limited Edition. At US$6,500 the LE cost $2,000 more than the standard GSX-R750 and was the most expensive Japanese sportsbike of its time. It featured bits like a gold-plated chain, high-performance radial tyres, single seat, tail section made of hand-laid fiberglass, dry clutch, 41mm ‘NEAS’ front forks (with an electrically activated anti-dive mechanism), three-point steering damper and twin 310mm brake discs up front. And at 176 kg dry, the LE was also 3kg lighter than the standard GSX-R750. These things may not sound special today, but added up to a pretty trick sportsbike back in 1986.